The portion of the online population visiting social media sites has grown by 12% in the past year, according to Nielsen’s Online Ratings, with Facebook reaching 71% of the active online audience, and Twitter and LinkedIn reaching 13% each. Nielsen’s analysis found that the member communities category, which is mostly made up of social networks, attracted a unique audience of 11.9 million Australians in April, a 12% year-on-year increase. This increase came despite a less active month overall for internet users. April saw 15.3 million Australians go online, a drop of 5.1% month on month. Google remained the most visited site overall, with a reach of 88% of the active online population and an average of 32 visits per person, while Facebook placed second but continued to dominate for time spent on site, at eight and a half hours per month. Blogger, Google’s blogging platform, was the second most visited site among the member communities category, and the tenth most visited overall, with a unique audience of 4.5 million people, 30% of the active online population. Commonly used marketing tool, Twitter, was accessed by 13% of the active online population in April, with the average visitor making 6.41 visits and spending 21 minutes on site per month. 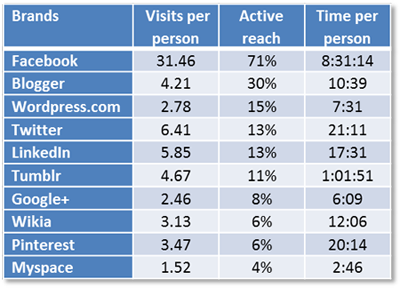 Read: The best and worst times for Facebook and Twitter posts. LinkedIn attracted a similar audience size but slightly fewer views per person at 5.85, and less time on site at 17 minutes per month. Rising star Pinterest was visited by 6% of the active online audience, with visitors making an average of 3.47 stops and spending just over 20 minutes on site per month. Google+ attracted an audience of 8% but suffered from lower views per person and significantly lower time on site than its competitors.